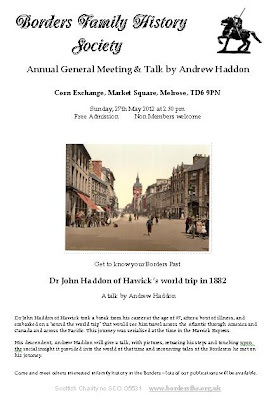 Our next talk is on Sunday, 27th May at 2.30pm, in the Corn Exchange, Market Square, Melrose, TD6 9PN, when Andrew Haddon will be talking to us about his ancestor, Dr John Haddon of Hawick, Roxburghshire, who took a break from his career at the age of 37, after a bout of illness, and embarked on a 'round the world trip' in 1882 that saw him travel across the Atlantic through America and Canada and across the Pacific. This journey was serialised at the time in the Hawick Express. His descendant, Andrew Haddon will give a talk, with pictures, retracing his steps and touching upon the social insight it provided into the world of that time and recounting tales of the Borderers he met on his journey. The talk is preceded by our annual general meeting. In addition to the usual reports we'll be discussing the proposed change to our constitution. The doors will be open at 2pm; the talk begins at after the annual general meeting. It’s free, so we hope to see lots of you there. As usual there’ll be tea, coffee, and biscuits available after the talk. We’ll also be making the monthly 50-50 draw at the meeting. If you're not familiar with Melrose, here's a map. Our latest volume, Coldingham Monumental Inscriptions is available.